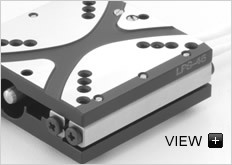 This compact low profile linear piezo positioner is also available as an X-Y combination. Closed loop and open loop versions are offered. The optional linear encoder provides nanometer repeatability. Vacuum compatible and non magnetic versions are feasible. The large platform and the cross roller bearings provide excellent guiding precision and smooth, highly accurate motion in the nanometer range with travel ranges of 1/2 inch and 1 inch. LPS-45 stages can be controlled with the E-870 open loop drive and the E-871 closed loop piezo motor controller. The stage achieves high speed to 10 mm/sec.